Recently I downloaded ABC Wildlife from iTunes. 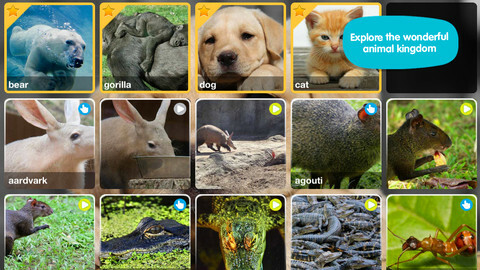 I liked the idea of an iPad app that encouraged learning about animals, with the added promise of some fun along the way. However, I'm a little puzzled by the ABC Wildlife app. There are lots of things I like about it, but I'm not quite sure of the age I would recommend it for. Kids of all ages love animals, and they'll enjoy finding out about them via the images, the single fact and perhaps a video. (Sadly, not all animals have videos associated with them, and video quality is patchy.) But it's the interactivity that puzzles me the most - it's very simple and repetitive. Basically, kids wipe their fingers across an image to reveal something underneath, usually another image. That simplicity makes it ideal for young kids. Those same kids would in most cases not be able to read, or in some cases comprehend the included animal facts. Each animal has a single fact about it, and facts are quoted as coming from Wikipedia. Judging by the developers' website, their apps are targeting under-fives, so perhaps they want parents to discuss the fact with their kids. I guess I was hoping for simple vocabulary and sentence structure more suited to younger kids. However, put those things aside, and you will find an app that has the potential to engage kids in learning about animals. The main screen is an alphabetised screen of thumbnails. Click on any thumbnail and it opens into a high-quality image of an animal. Animals range from domestic to wild, and include some unusual ones, even some Australian animals. Navigation is simple and works very well. The animal name and the alphabet letter it starts with is also read aloud to kids, reinforcing those concepts. One feature I really love from these developers is the way they have provided very well-explained related activities for kids at their website, like this Art Layers activity with downloadable animal silhouettes. So if you know a child who LOVES to find out about animals, this is an app to check out. It's great for kids to learn via multimedia. Add in a trip to the zoo, or a farm and a visit to the library to find some great animal books to share, and you're providing kids with a varied learning diet. Check out my iPad reviews board on Pinterest!